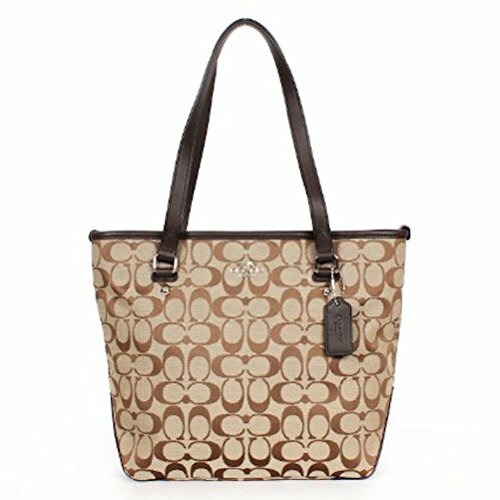 This medium size tote is wrapped in Coach's dual tone 12cm Signature C print jacquard with leather accents and polished hardware. Coach's fabrics are specially treated to repel water. The lined interior features a zippered pocket, two open slip pockets and a pen slip. Coach's creed and authenticity patch is contained inside. It has a zippered top closure with Coach's logo lozenge and removable leather hangtag accenting the front. The back features a zippered pocket. The dual handles have a comfortable drop of about 8.5 inches. The overall measurements are approximately 12 inches (L) x 10.5 inches (H) x 5 inches (W). Manufactured by Coach for distribution in their Coach Factory stores. Coach does not include a dust cover bag.